This is a great activity for your literacy centers! 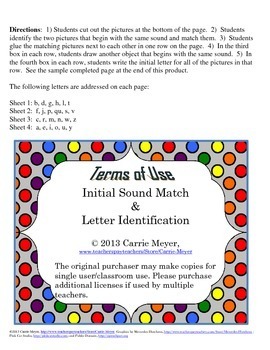 This product contains 4 activity pages which give students opportunities to match two pictures with the same initial sound, draw an additional picture of their own that also begins with the same letter, and then write the letter. 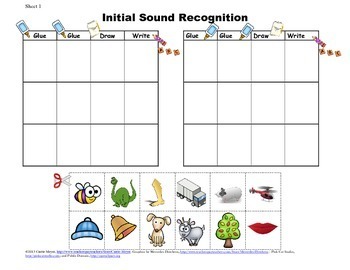 Each page contains pictures for 6 different sounds. A sample finished product is also included. 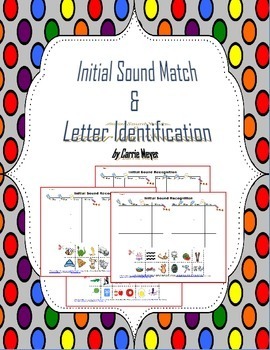 Initial Sound Match & Letter Recognition by Carrie Meyer is licensed under a Creative Commons Attribution-NonCommercial-NoDerivs 3.0 Unported License.